World-leading collision avoidance and fatigue monitoring systems are at the heart of Hexagon Mining’s commitment to safer, smarter mining. Our proven technology is at work in more than 20,000 vehicles in over 50 surface mines worldwide, with a wide range of advanced traffic safety solutions. Hexagon Mining’s solutions include collision avoidance, real-time full-fleet tracking, fatigue monitoring, systems to protect cleanup equipment around heavy rotating machines, and sophisticated displays that intuitively integrate vital safety information in cabins. Hexagon Mining develops and supplies traffic safety and collision avoidance systems (CAS), and fatigue monitoring technology to improve safety at surface mines. The company’s technology is suitable for all types of vehicles to protect both machines and workers from collisions onsite. As part of a comprehensive, integrated system, Hexagon Mining offers a range of advanced collision avoidance technologies designed to target each risk point of a surface mine. The modular nature of the system means clients can choose which elements are most suitable for their operation, or if they wish to deploy the entire solution for the best results. Combined with the real-time fleet tracking and reporting module, this system saves lives. CAS provides vehicle operators with 360° proximity detection when travelling at any speed and in all conditions, via non-intrusive cabin display units. Not only is vision improved, but situational awareness is heightened, as a GPS unit calculates the vehicle’s speed and path of movement. Positional information of each vehicle fitted with the system enables real-time traffic alerts. Operators can see where other vehicles are and where they are heading. The system’s in-built safety zone feature predicts potential collisions in advance and alerts the drivers. Vehicle monitoring interface: TRACK monitors mine fleets in real-time through a web interface, offering customisable reports, as well as enabling users to send text and email alerts to system users. Traffic path detector: TrackingRadar works with the CAS to detect the path of moving mine vehicles or obstacles, such as ground personnel. The radar integrated with CAS locates multiple objects and tracks them simultaneously, while differentiating between threatening and non-threatening objects in the surrounding area. Collision avoidance and camera views for haul trucks: SafetyCentre is a single operator interface for all information pertaining to traffic safety. The Hexagon Mining SafetyCentre enhances safety operations of haul trucks with a single display showing surrounding vehicles from TopView, integrated with up to six different camera views, TrackingRadar alarms and CAS alerts. Shovel assisting proximity detector: ShovelAssist enables shovels to work efficiently with minimal risk, by adding visual information together with radar and collision avoidance alerts of the entire loading and swing area. Hexagon Mining FatigueMonitor system provides an intuitive display within the vehicle, which integrates multiple technologies associated with both fatigue-level detection and collision avoidance. The system monitors mine operators to spot early signs of fatigue and lack of attention, to ensure safety levels are maintained. Operator data is then recorded in profiles for reports and performance indicators. Hexagon Mining offers three types of display screens for vehicle operators, depending on the level of complexity required. The most basic model is a simple display with LED indicators and auto-dimming function. The moderate display provides a TopView of surrounding area and vehicle identifications. The most advanced screen provides split camera views as well as the TopView. The Safety Division of Hexagon Mining works with its sister technologies to offer mining clients a complete solution from planning to operations, in order to improve safety and productivity. Hexagon Mining’s safety product suite is recognized globally and protects more than 20,000 vehicles in over 50 mines worldwide. Located in the state of Colima, Peña Colorada is one of the largest iron ore operations in Mexico. The project is owned in equal parts by ArcelorMittal and Ternium. 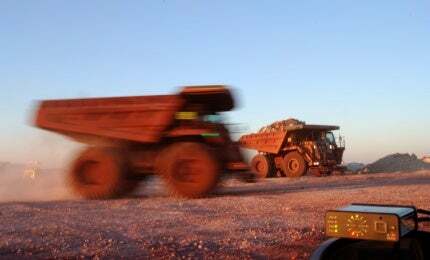 In 2012, Teck sought a technology standard for vehicle safety across all of its operations. SAFEmine develops collision avoidance and fatigue monitoring systems that protect drivers and operators from collisions in busy surface mines, especially where large and heavy machinery are operating. Hexagon Mining will be previewing new advances in mining technology at the quadrennial MINExpo show, 26-28 September, in Las Vegas, Nevada. Hexagon Mining is introducing a new campaign to appeal to the aggregates and industrial minerals sector of the mining industry. Hexagon Mining has launched HxM Athena Planning, a performance-indicator bundle that makes sense of data from production planning, grade control, fragmentation, drill operations, and plan compliance. Interactive heads-up displays are integral to HxM Athena, a solution that empowers miners to transform data into knowledge and builds on Hexagon Mining's vision of smart change. Another South African mine has turned to Hexagon Mining for a safer, more productive future. As of today, the South Africa's Department of Mineral Resources regulations are in force, calling upon surface mines to enhance safety for all trackless mobile machinery (TMM) such as trucks. Hexagon Mining has announced the appointment of Helio Samora as president, effective immediately. Hexagon Mining is part of Hexagon, the leading global provider of information technologies that drive quality and productivity improvements across geospatial and industrial enterprise applications. "The SAFEmine CAS went off and alerted me that a vehicle was coming and within a second there was big 793 dump truck coming down on me, so the system basically saved me." Based on the successful SAFEmine CAS and scientific research, SAFEmine has developed the first multi-technology fatigue detection system for monitoring driver alertness within the mining environment. A leading mine in South America recently conducted a survey, polling their vehicle operators on the view of and experience with the SAFEmine’s Collision Avoidance System (CAS). SAFEmine is presenting their revolutionary TrackingRadar at the Queensland Mining & Engineering (QME) Exhibition on 22 to 24 July at stand A162. The new TrackingRadar offers improved protection for mining personnel and the vehicles they operate, while increasing overall efficiency of mining operations. SAFEmine, which provides the market leading collision avoidance system (CAS) for open pit mines, will be exhibiting at the Queensland Mining & Engineering Exhibition in Mackay, Australia, during 22 to 24 July. The Samarco iron ore mine in Brazil has installed the SAFEmine Collision Avoidance System (CAS) on 120 vehicles, consisting of haul trucks, graders and light vehicles. SAFEmine will speak and exhibit at the HxGN LIVE 2014 conference in Las Vegas, US, from 2 to 5 June. Top experts, customers and partners from the world of technology will gather to exchange their knowledge and experience of the latest trends and solutions across various industries. SAFEmine has announced the company's acquisition by Hexagon AB. Founding members, Urs Rothacher, Andrea Schlapbach, Urban Maeder, Peter Stegmaier, released a statement on behalf of the company. SAFEmine Ltd will be exhibiting at the event at Booth 1532. Hecla Mining Company is pleased to announce the Greens Creek mine near Juneau, Alaska, received the National Institute for Occupational Safety and Health (NIOSH) Mine Safety and Health Technology Innovations Award. Samarco Mineração, an internationally known Brazilian mining company, has received an award for purchasing the Collision Avoidance System (CAS) unit number 15,000 from SAFEmine for the Germano mine. SAFEmine's partner in Brasil, Devex Mining, had initiated installation of the SAFEmine CAS in late 2012 and now over 160 vehicles are protected at Samarco Mineração. At the 142nd SME Annual Meeting & Exhibit, Feb. 24-27, 2013 in Denver (CO, USA), Todd Ruff, SAFEmine's business development manager for North America, will present the results of a trial of SAFEmine's Collision Avoidance and Traffic Awareness Technology at Teck's Line Creek Operations. SAFEmine has released a free white paper on Mining Technology about a surface coal mine that needed a way to track the location of their service trucks to dispatch them efficiently to the closest equipment in need of service. A six-week trial of SAFEmine's Traffic Awareness and Collision Avoidance System was conducted at a surface coal mine in British Columbia, Canada. SAFEmine presents the world's first all-in-one Collision Avoidance System, the SafetyCentre. The patented SafetyCentre de-clutters the cabin of mining equipment and optimises traffic safety alarms by intelligently integrating SAFEmine Collision Avoidance, radar, cameras, and other traffic safety related systems onto a single monitor. SAFEmine will be exhibiting at MINExpo International, taking place in Las Vegas, Nevada, US, on the 24-26 September 2012. SAFEmine has released a free white paper on Mining Technology about the challenges associated with traffic on single-lane mine access roads, in particular the Hecla's Greens Creek Mine in Alaska. SAFEmine Technology (USA) is pleased to announce the appointment of Todd Ruff as Business Development Manager for North America. Todd brings over 24 years of experience in mine safety technology research and development to SAFEmine. SatNetCom has announced that it is promoting, selling, installing, and servicing the collision avoidance system (CAS) from SAFEmine to enhance traffic safety in surface mines and minimize economical risk due to shutdown time. On 9 September 2011, during the Asia Pacific International Mining Exhibition (AIMEX) in Sydney, SAFEmine presented Thiess Australia with an award to mark the delivery of the 10,000th SAFEmine unit.